Moving is a big deal for seniors, especially those living with conditions such as dementia. The uncertainty of a new move could make them nervous, confused, and agitated, which is why family caregivers need to find ways to make the transition to another home easier on aging parents who are living with dementia. Here are some tips your family can use when helping a loved one with dementia move into a new home. Your loved one may need to downsize when moving into a new home, and it might be difficult to part with objects that have brought him or her so much comfort since being diagnosed with dementia. However, you can make moving a little easier by saving your loved one’s favorite objects. Sensory stimulation can boost mood, lower the risk of depression, and increase social interaction. Find out what your loved one wants to take, and allow him or her to help with the moving process. On the day of the big move, ask some familiar faces to come along. It’s a good idea to take your loved one to the new place ahead of the movers because it allows him or her to take a look at the home while being surrounded by familiar faces. Having close friends and family members around may make the new house more comfortable. Choose a time of day when your loved one is more relaxed, such as early afternoon. If you’ve already decided to hire a professional caregiver to help your loved one in the new home, make sure the caregiver comes along, too. If you haven’t found a caregiver yet, it’s best to do so before the move so your loved one can get to know him or her ahead of time. Families looking for top-rated Montgomery respite care providers can reach out to Home Care Assistance. From respite care to specialized Alzheimer’s, dementia, stroke, and Parkinson’s care, there are many ways we can make life easier for seniors and their loved ones. During the move, provide meals and snacks that ease your loved one’s mind. In addition to the first day of moving into a new home, serve your parent’s favorite meals during the first couple of weeks after the relocation. Eating familiar foods can help seniors with dementia grow accustomed to a new home, and they may also have an easier time continuing their regular routines. Familiarity is one of the best ways to comfort adults with dementia because it calms the mind and provides a sense of belonging. Routines can help seniors with dementia maintain a sense of normalcy and comfort, but it’s not always easy to make sure they stick to a schedule. Dementia can be challenging for seniors to manage, but they can maintain a higher quality of life with the help of professional dementia care. Montgomery seniors can benefit greatly from the Cognitive Therapeutics Method (CTM), an activities-based program designed to promote cognitive health and delay the onset of dementia. CTM is included at no additional charge with any of the in-home care plans provided by Home Care Assistance. Moving can be just as hard on family caregivers as it is on their aging loved ones. Enlist as much help as possible. Since your family and friends are there to provide moral support, you should hire professional movers to take care of the heavy lifting and loading, allowing you to focus more time on your loved one. Hiring professionals can eliminate some of the stress that comes with moving an elderly loved one with dementia into a new home. After the move, do something relaxing for yourself, such as dinner with friends, movies with your spouse, or a day at the spa to help you relieve some tension and boost your overall wellbeing. Of course, it’s just as important to focus on your loved one’s long-term care after the move. Caring for an aging adult with dementia can be challenging for anyone. If you’re the primary family caregiver for an elderly loved one and need additional assistance providing high-quality senior care, Montgomery Home Care Assistance can help. We are a leading home care agency committed to changing the way seniors age. Home Care Assistance will work with you to customize a care plan that’s just right for your loved one’s needs. 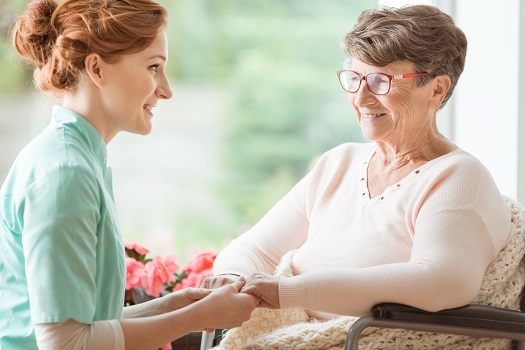 Call us today at (334) 593-3988 to discuss how we can give you the peace of mind that comes from knowing your loved one is being cared for with professionalism and compassion.